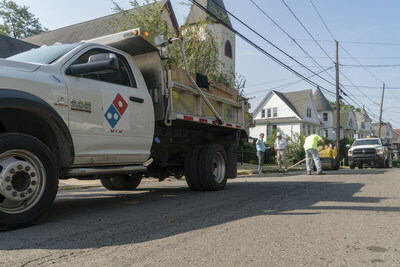 ANN ARBOR, Mich., Aug. 29, 2018 /PRNewswire/ -- Domino's, (NYSE: DPZ), the largest pizza company in the world based on global retail sales, promised to save carryout pizza, one pothole at a time, with its Paving for Pizza program announced in June. Domino's asked customers for their nominations and they delivered, submitting more than 137,000 nominations from 15,275 different zip codes in all 50 states. Customers submitted so many nominations, in fact, that Domino's decided to expand the program to pave one community in each state! "We knew that people were passionate about pizza, but we discovered that Americans are also very passionate about potholes," said Ritch Allison, chief executive officer of Domino's. "The overwhelming response that customers had to the program will mean more pizzas arriving safely in communities across all 50 states." Customers who haven't submitted a nomination yet may still do so by visiting pavingforpizza.com. Domino's will accept nominations through Dec. 31, 2018. "Potholes in Northeastern Pennsylvania are as prevalent as our region's love for pizza," said Mayor Tony George. "I am incredibly grateful to Domino's assistance in repairing and patching our roads." For a continuously updated list of cities that have accepted paving grants, visit pavingforpizza.com. Founded in 1960, Domino's Pizza is the largest pizza company in the world based on global retail sales, with a significant business in both delivery and carryout pizza. It ranks among the world's top public restaurant brands with a global enterprise of over 15,100 stores in over 85 markets. Domino's had global retail sales of over $12.2 billion in 2017, with more than $5.9 billion in the U.S. and more than $6.3 billion internationally. In the second quarter of 2018, Domino's had global retail sales of nearly $3.1 billion, with nearly $1.5 billion in the U.S. and nearly $1.6 billion internationally. Its system is comprised of independent franchise owners who accounted for over 97% of Domino's stores as of the second quarter of 2018. Emphasis on technology innovation helped Domino's achieve more than half of all global retail sales in 2017 from digital channels, primarily online ordering and mobile applications. In the U.S., Domino's generates over 60% of sales via digital channels and has produced several innovative ordering platforms, including Google Home, Facebook Messenger, Apple Watch, Amazon Echo, Twitter and text message using a pizza emoji. In late 2017, Domino's began an industry-first test of self-driving vehicle delivery with Ford Motor Company – and in April 2018, launched Domino's HotSpots™, featuring over 200,000 non-traditional delivery locations including parks, beaches, local landmarks and other unique gathering spots.